The BBC documentary is both an orientalist exercise and a potentially dangerous document for the journalist’s sources. Despite the fact that BBC Three is a youth-oriented channel, the program is out there on the internet for all to see (officially only accessible in Britain, but Facebook users already managed to sneak out bootlegged versions). What British youth – and the world – see watching Dictatorland is an immature depiction of the post-Soviet region produced and endorsed by the BBC, which many regard as the North Star of journalism. There are several major problems with designing and shooting such a documentary, spanning from its objectives to its delivery, from ethics to usefulness. Dictatorland is not a piece of investigative journalism. It fails to uncover anything new or original of the countries visited, especially in Central Asia. All the information in the documentary is either easily found via quick internet research or already spelled out in one of a handful news outlets covering the region in English. Zand openly says that he traveled to the region under the false guise of shooting a travel documentary, exposing the whole feat to a substantial ethical problem: if its goals are not investigative, what is the point of going undercover? The goal, in fact, was just to feed the audience a negative portrayal of these countries, highlighting just how awful is to live under a dictatorship. This makes the crew’s disregard for the required permits to film in certain areas even more staggering. Is it necessary for the audience to see “once sensitive areas” when nothing is happening there? Or is the consequent police questioning just the clip Zand was after for his collection of authoritarian harassment? On a plane to Tajikistan, he preventively cut his beard on camera because a few years ago the Tajik authorities started a policy of forcibly shaving the beards of some pious Muslims in an effort to curb terrorism. In an interview with one of the victims of the authorities’ razor, Zand points out to the absurdity of cutting all the beards, because “if terrorists could be spotted just because they have a beard it would be easy to catch them.” Unsurprisingly, his sassy analysis fails to point out the real objective of the whole anti-terrorist program in Tajikistan, which is mostly a control mechanism and a way to reach out to the West as a bastion against terror. In his journey to Kazakhstan, Zand goes out to the oil town of Zhanaozen, which was the stage of months of protests and violent unrest in 2011. There he interviewed some of the survivors and the activists who have criticized the government’s reaction to the incidents. Incredibly, in one of his first statements, Zand admits that he lied both to the authorities and his sources about the purpose of his trip. “Getting into these countries is hard, so we told the authorities we were making a travel program and none of the interviewees would know it was actually a series about dictatorships, for their safety and mine,” Zand said. This, aside from shattering most of journalism’s fundamental ethical boundaries, actually does the opposite of what Zand said. In an overemphasized scene, Zand and his crew were apparently besieged in their hotel room by the local police “looking for foreigners.” Most probably, it was the usual secret service surveillance that anyone living in Kazakhstan, especially when traveling without the required permits, is used to witnessing. 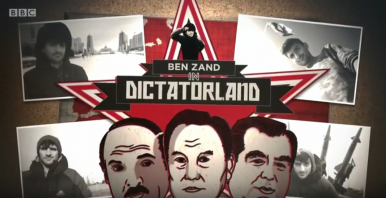 While Zand’s safety in the end did not seem to be in danger, Dictatorland puts several dissidents and activists under the spotlight, quite literally. With their names and their faces in plain sight, they are the ones that are left behind in the country dealing with the security forces, not Zand, who has now moved on to the next assignment. One example is the interview with opposition figure Zhanbolat Mamay, who was arrested two months later and charged with money laundering. The interview itself could not have affected the court’s judgment against Mamay, but it will now certainly impact his conditions in prison. And finally, this behavior is also dangerous for those who do research on the region, whether from the private sector or academia, and others, whether local or foreigners, who wish to try the noble task of investigative journalism in these countries. Thanks to Zand’s documentary, they could now face tougher interference from the authorities, be denied access, or harassed. When it comes to documentaries, Dictatorland is a poisonous cocktail that risks undoing the work of many professional journalists and practitioners in uncovering injustices around the post-Soviet space.